Motorola began the soak test of a new software update for the DROID MAXX and ULTRA this morning, which Verizon has now approved and posted support documents for. The update is indeed of the camera-improving variety, weighing in as build 12.15.10. 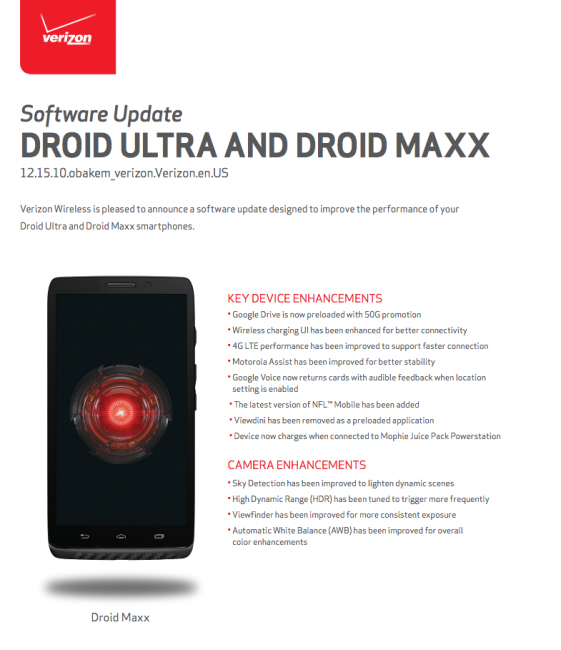 According to Verizon’s changelog, you will see the same exact enhancements to the camera that the Moto X saw, including better sky detection, quicker to fire HDR, improved view finder, and overall color enhancements. Outside of the camera improvements, owners of the MAXX and ULTRA will also welcome in a new 50GB Google Drive promotion. Motorola tweaked the wireless charging UI (for the MAXX), improved 4G LTE performance, updated NFL Mobile, removed Viewdini, improved Motorola Assist, and somehow tweaked Google Voice, though we think they screwed up there. Again, the soak test is happening now, but if Verizon has given the update the go-ahead, it could be only a matter of days before you all see it.